Exactly when did Jesus die? When should we take the bread and the wine? bread and the wine in remembrance of His sacrifice for mankind. will give is my flesh, which I will give for the life of the world. This is to be done on the night, of the day, The LORD died upon the cross as our Passover sacrifice. Jesus did not do this once a week, he did not do this once a month, He did not do it every day, or just any day. He only took the bread and the wine on the night, of the day, He was betrayed. So, this brings up the question - "exactly when did Christ die?". Was it the 13th of Abib (the day of preparation for the Passover) or the 14th Abib (the Passover)?? was no leavening in the home when the 14th started. 14th, exactly when the Passover lamb was to be slaughtered. the leaven was removed so that there was none in the home by the start of the 14th. 13th a person will be transgressing by having leavening in the home when the 14th starts at sundown. Jewish neighbors. Certain places, where the likelihood of finding ḥameẓ was infinitesimal, were exempt (see "Yad," l.c. transferred to the eve of Sabbath when the 14th of Nisan coincided with the Sabbath. with the blood that is in the bason; and none of you shall go out at the door of his house until the morning. posts, the Lord will pass over the door, and will not suffer the destroyer to come in unto your houses to smite you. can, and should stay in our homes the night of the 14th. Wace. American Edition, 1890. Online Edition Copyright © 2004 by K. Knight). leaven was avoided and that no contact was made between the lamb meat and leaven. 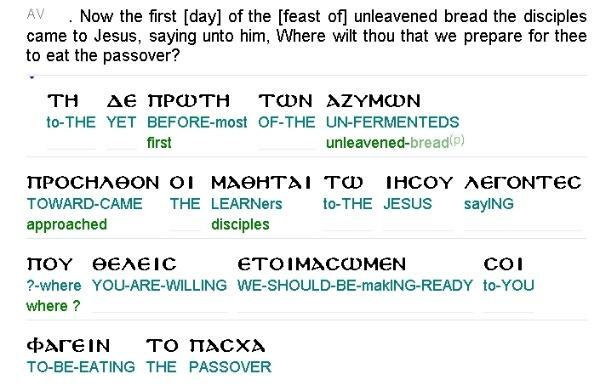 purposes of The Passover "even" was from noon to sunset. The people were to eat the lamb, destroy the leftovers and not go outside after sunset. And what do you want to bet the Apostles did exactly that the night after Jesus died?? Tuesday the 12th of Abib - Late in the day Christ sent the apostles to rent the upper room, and they all went there. bread). Jesus and the Apostles started the day in the "upper room", which they rented late on the 12th. Christ performed the "bediḳat ḥameẓ" or the 'search for leaven', He found Judas Iscariot, who was purged that evening. the Father, having loved his own which were in the world, he loved them unto the end. The LORD died late in the day of the 13th (John 19.31), the "even" between the 13th + the 14th, and was put into the tomb. LORD's body could not be tended without touching a dead body, thereby being made ritually unclean on this Annual Holy Day. day as it is a commanded, Annual Sabbath. And true to His word The LORD rose exactly three days and three nights after dying, ON SATURDAY AFTERNOON. days and three nights and have Him die on the 14th. of Unleavened Bread - they could not tend the body that day - it is an annual Sabbath. This would be a normal work day - why not tend the body?? days and three nights - OR BOTH. The LORD died on a Wednesday the 13th of Abib, late - right before sunset, which started the Passover = the 14th. So I think it is obvious they were still observing both. - right before the beginning of The Passover, sundown between the 13th and the 14th. The events of Christ death lineup perfectly with the Exodus account - our Passover must be slain at the beginning of the 14th. Do you really want to accuse The LORD of sin in order to defend a false doctrine?? night of the 14th, or of having an improperly slain lamb that night in The Upper Room. wasn't that way before, as evidenced by the two eyewitness accounts above. reappearing both in the legend associated with the holy day as its assumed historical setting and occasion, and in the ritual. The Jews do weed the sin (which is the transgression of God's Law - 1 John 3.4) out of their lives - they hold fast to God's Law. But they are not covered by the blood of Christ - yet. They will come into the New Covenant during the second resurrection. The "even" of the 14th is at the very beginning of it - in the Bible the days always begin and end at sunset. Same as the footwashing was totally new - these two commands only apply to Christians. The 14th celebrates and commemorates the salvation that the sacrifice of The Lamb brings. The 15th acts out the removal of sin, pictured out by leaven, seven symbolizes completion. (according to Joesephus 250,000 lambs were slaughtered) at The Temple, at the proper time. the gods of Egypt I will execute judgment: I am the Lord. shall not be upon you to destroy you, when I smite the land of Egypt. that is in the bason; and none of you shall go out at the door of his house until the morning. night before, the night of the 14th, not the night of the 15th. Rameses preparing to depart from Egypt.